Istanbul is truly a world city, a city which everyone should visit at least once in their lifetime. 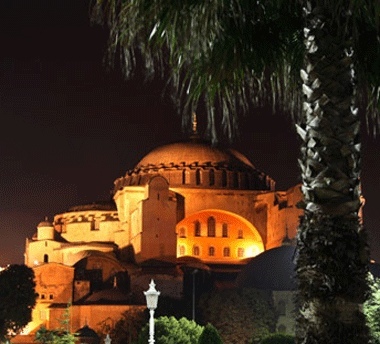 As Byzantium, Constantinople and finally, Istanbul, it has been the capital of three Empires, each leaving their mark in the form of stunning palaces, castles, mosques, churches and monuments. The legacy of its chequered past can be seen on every turn of the modern city. It is a city of contrasts, bustling with the cacophony of 21st century life, and is yet achingly beautiful. It is set in a stunning location, surrounded by water, which is the narrow strait of the Bosphorus and the serene sea of Marmara separating Europe from Asia. Istanbul has a foot in each, celebrating the best of both heritages. The European side, however, is also divided in two by the Golden Horn or Haliç, which roughly divides the historic part of old Istanbul, encompassing the areas of, Sultanahmet and Laleli, from the modern city. Most visitors on short city breaks stay in the old town as the vast majority of the sites which they will be visiting are in this area. Istanbul's most famous sites - The Blue Mosque or Sultan Ahmet Cami, Aya Sofya (Hagia Sophia), Topkapi Sarayi (Palace) and the Grand Bazaar (Kapali Çarsi) - are all within a 30 minute walk of each other. In terms of accommodation, there are now a number of boutique hotels in the area of Sultanahmet, many of which are restored Ottoman wooden mansions. These are ideal for those who really want to savour the authentic atmosphere of the Old Town. Those on a budget, may want to consider the more modern, and competitively priced hotels of the Laleli district, although this area is much busier. Although it is convenient, the disadvantage of staying in the Old Town, is that, since it is not a residential area, you don't really benefit from the ambience of the modern city of Istanbul, with its excellent restaurants, lively bars, and cosmopolitan feel. Some of Istanbul's finest, most luxurious hotels are located on the Bosphorus with stunning views over the straits, or in the modern business districts. 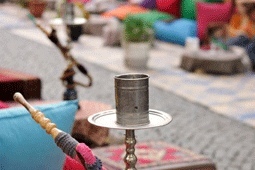 There are also some historic establishments in the area known as Pera, which blossomed at the turn of the last century. 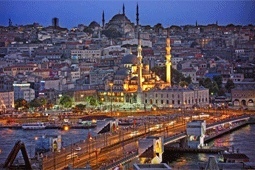 The heart of modern Istanbul, is Taksim Square and the streets around. The advantage of staying here is that in the evenings you have a wealth of restaurants and relaxed bars within an easy walk of your hotel. Wherever you choose to stay, it doesn't take much to make the most of the city, and even three days will give you the opportunity to see the highlights. It is such a large city, however, that even if you visit time and time again, you can still discover something new each time. It is easy to get around. There are a couple of handy trams - one in the old town, and the other in the main shopping street in Pera, Istiklal Caddesi. That’s not to say that the locals are turning their backs on much-loved city institutions such as the raki-soaked meyhane (tavern) or tranquil çay bahçesi (tea garden), because they wouldn’t dream of doing anything so foolish. They know, after all, that such institutions are one of the reasons that their home is – and always has been – rightfully dubbed the ‘City of the World’s Desire’. The best times to visit Istanbul are around spring (April–May) and autumn (September–October), when the climate is perfect. During July and August it is hot and steamy; a lot of Istanbullus head for the west and south coasts over these months. Biting winter winds and snow are common in winter. 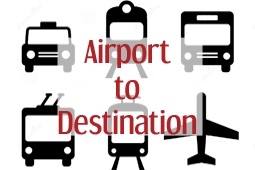 Upon arrival into Turkey you must purchase a Visitor's Visa - this is done in the airport of arrival. The fee is €15 per person and must be paid in Euros - Turkish Lira (or any other currency) is not accepted. In Sultanahmet, it's rare to nosh in stylish surrounds without paying through the nose for the privilege. That's why this teensy lokanta in the gorgeous courtyard of this Sinan-designed medrese near Topkapi Palace is such a find. The food isn't anything to write home about, but it's fresh and cheap as chips, so who's complaining? Near the Wall at Samatya, on the Sea of Marmara, the five floors (including a roof terrace) of Develi are always full of happy punters enjoying the flavours of southeastern Anatolia. It's been serving up kebabs to hungry locals since 1912, so Develi really knows what it's doing when it comes to the national dish. Try the çig köfte (raw ground lamb, bulgur , onions and spices) and the fistikli (pistachio) kebab and you'll feel happy too. A secluded flower-filled garden and fairy-tale-like glass conservatory around the corner from Aya Sofya is waiting just for you. 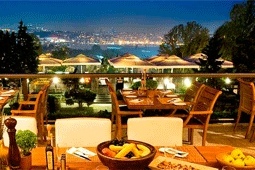 You'll find Konuk Evi one of the most relaxing places in the city to enjoy an al fresco lunch. Salads, burgers, sandwich and grills are all good value considering the surrounds. Inci (56 Istiklal Caddesi) – on the pedestrianized street in Beyoglu – is where the profiterole was invented, and still does them to chocolatey perfection. Instead of cream they use custard, and the chocolate is dripping and divine. Run by glamorous red-haired film actress Yasemin Alkaya, 5 Kat is one of the city's original glamour bars. The 'boudoir chic' décor features deep red walls, satin ceiling, velvet chairs and candles galore - it's amusingly over the top. The Bosphorus views from the full-length windows are simply breathtaking and in the warmer months there's a rooftop terrace bar as well. The only authentic Irish bar in town, this popular place is a good spot to enjoy a pint and a craic . There's a mixed crowd and a popular all-day breakfast. It occasionally organises live sessions of traditional Irish folk music and performances by Irish singers. You're going to find every top brand and designer name in Istanbul - this city is a shoppers paradise. Let's get the obvious out of the way first of all - go to the Grand Bizaar. It is exactly all that - it's huge and it's bizarre but it's so well worth visiting! Akmerkez.....Akmerkez is located in Etiler, a neighborhood of the Besiktas district and one of the favorite areas among Istanbul’s elite. It is also close to the business quarters of Levent and Maslak. Istinye Park.....Located in the Istinye neighborhood of the Sariyer district, Istinye Park has brought a new dimension to Istanbul’s shopping concept. Spread out over an area of 242.000 sqm, the shopping center offers a variety of outdoor and glass roofed indoor sections such as a green central park, Fashion District, street side shopping, a kids’ entertainment center of 1.500 sqm, Hillside Sports and Leisure Club, The Bazaar — an area inspired by historical Turkish architecture — and 12 movie halls, one of which being IMAX 3D. Kanyon.....As a four-storey shopping center located in the financial district of Levent, the 37.500 sqm shopping center has 160 stores among which Turkey’s and the world’s most selected brands, gourmet restaurants, cafes, a health and sports club and movie halls. City's.....In case you enjoy being in the center of fashion, let alone shopping, you have got to see City’s in Nisantasi, part of the Sisli district and very close to Taksim. 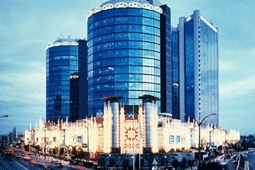 City’s is a shopping center which blends in with the historical texture of the area. Nisantasi.....This is not a shopping center, but a district within walking distance of Taksim known for committed shoppers in search of sophistication. 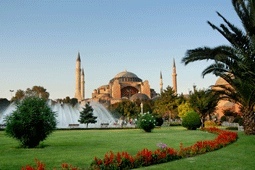 Mosque.....Hagia Sofia (known as Aya Sofya in Greek and also called the Church of the Divine Wisdom). This was regarded as the greatest church in Christendom up until the fall of Constantinople, when it was put back into service as a mosque. The edifice is crammed with fine mosaics and topped by a magnificent dome. 'Blue' because of its stunning interior decorated with Iznik tiles, this mosque is one of the city's largest and busiest. Sultan Ahmet set out to build a mosque that would rival and even surpass the achievment of Justinian. He came close to his goal. Grand Bazaar (Kapali Çarsi) has been a shopper's Mecca since just after the mid-15th century, when the smallish warehouse was turned into a teeming bazaar by a constant stream of traders, selling everything from carpets to cummin. These days it's the most fantastic, monstrous, labyrinthine and totally manic shopping bazaar you could hope to experience. It's so huge, Topkapi Palace will take more than half a day to explore. If you start early you can avoid the worst of the crowds. The must-see parts are the Imperial Council Chamber, the Imperial Treasury, the Sacred Safekeeping Rooms, Baghdad Kiosk, the Tower of Justice and the Harem. It'll keep you busy. Basilica Cistern, with its 336 columns and a high, vaulted ceiling, is an incredible Byzantine relic that was primarily used to store the city's water. It was also used in From Russia With Love, although the days when tours were conducted on a flatbed boat are gone – a slightly disappointing walkway has been erected throughout.